- Desktop Camera Upload was re-importing High Efficiency format photos from iOS devices that had previously been imported via the Dropbox iOS app. This has been fixed. - The splash screen for the first use of Desktop Camera Upload incorrectly showed "Never for This Device" on the opt-out button -- it now correctly shows "Don't Ask Again", reflecting that opting out on the first usage will prevent prompts for any other devices connected in the future. - Fixed a bug around the handling of "untitled folder" and "New folder"
- Fixes rare error that causes Dropbox to fail to start with "Couldn't start Dropbox" dialog. - Mac OS X 10.11 support. Camera Upload is now enabled for OS X 10.11. - Minor fixes to the Badge. - Fixes an issue that could cause crashes on Windows if the CPU does not support SSE2 instructions. - Fixes an issue that could cause an account to become unlinked. - Initial Windows 10 support. - [Linux] Fixes an install issue in the nautilus-dropbox package in Debian and Ubuntu. - Improved network utilization on uploads for fast internet connections. - New Windows Installer with helper for updates. - Windows native shared folder dialogs. - Windows: User configuration data is stored in AppDataLocal on fresh install (instead of AppDataRoaming). - Upgraded to Python 2.7.9. - Fix issues with view-only shared folder icons on OS X. - Fix for rare startup issue. - Fixes tray icon issues for some Linux window managers (we are currently working with the Qt team for fixes for additional window managers). - Fixes issue where choosing a previous custom Dropbox location caused setup to fail on Windows and Linux. - Fixes rare issue that would cause infinite sync for some files. - This UI rewrite helps us fix a large number of issues/glitches you have reported over the years, improve performance, support high DPI on Windows, a new setup wizard on Linux, and more! 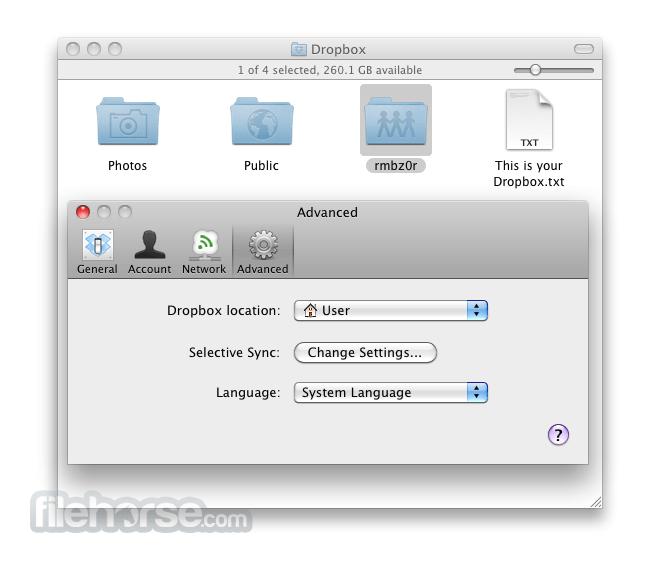 - File identifiers enable Dropbox to detect when files have been moved and renamed. In the future we'll be able to use this to improve features such as Previous versions. For now, this change should be invisible. 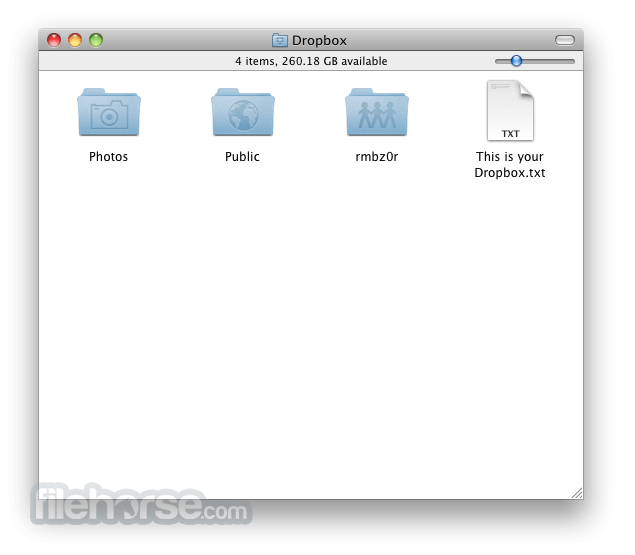 Let us know if applications working with files in your Dropbox start interacting differently. - While Dropbox on Windows now supports paths longer than 260 characters, many applications such as Windows Explorer and Microsoft Word do not. - We now have just one set of menu bar icons on Mac which are black and white. These icons fully support Yosemite's dark mode. 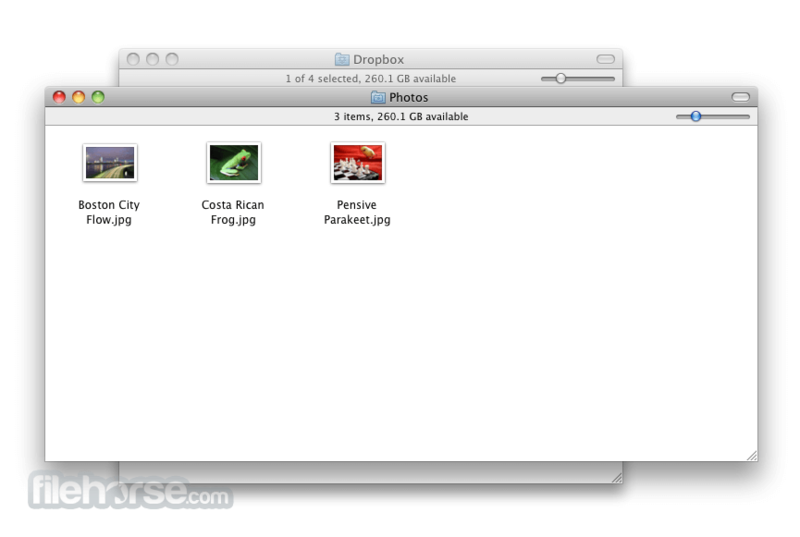 - On OS X 10.10 Yosemite, context menu items outside of the Dropbox folder are not supported. This means the "Move to Dropbox" context menu item is not supported. This is due to a limitation in Yosemite's Finder Sync Framework. - Translations for new strings. 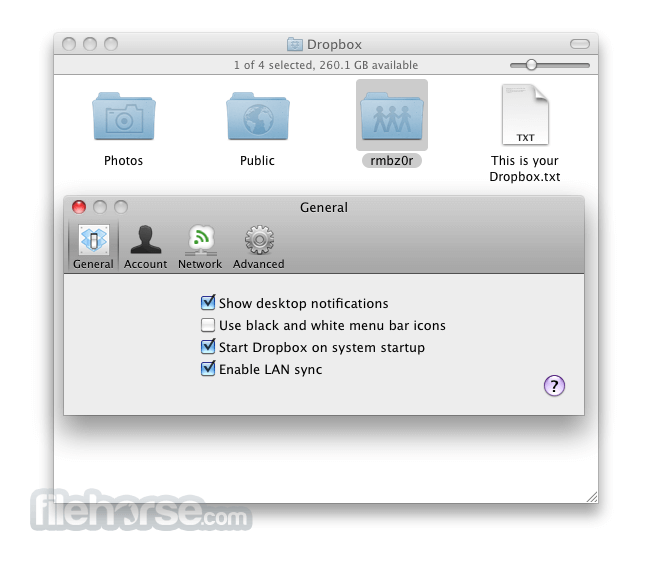 - On OS X 10.10 Yosemite, adds an option in Dropbox’s Preferences to disable Finder integration. As a result of issues in Yosemite, it’s currently not possible to disable Dropbox’s Finder extension using System Preference’s Extensions pane. - Fix for app icon on OS X 10.5. - Fix for two app hangs. - Fix for issues with tray icon and popup position on Mavericks. - Restored a missing icon image needed on some versions of Linux. - Prevents Finder crash on update. - Improved initial sync performance. - New languages: Danish, Dutch, Swedish, and Thai. - Over quota "Your Dropbox is full" screen. - Post new install "Upgrade to Pro" screen. - Option to disable "Move to Dropbox" context menu. - New languages: Danish, Dutch, Swedish, & Thai. - Then restart Dropbox normally. - Make proxy detection on Windows more robust. - Fix for notification message that kept coming back. - Fix Move Dropbox to a 2nd hard drive. - Fix un-dismissable notification message. - Fixes an issue where the second account would get unlinked if email associated with account changes. - Changes to camera uploads splash. - OS X 10.9 Mavericks support! - Security enhancements, an attacker will not be able to steal your computer's account credentials just by copying configuration files to another machine. - New encrypted database format to prevent unauthorized access to local Dropbox client database.